Philosophy for busy people. Listen to a succinct account of the philosophy of Aquinas in just one hour. Thomas Aquinas remains the unacknowledged maestro of Scholasticism - the static, cumulative philosophy of the medieval period. More a method of learning than pure theology, Aquinas' Scholasticism saw the careful synthesis of Christian doctrine with Greek rationalism - an amalgamation that came to define Catholic philosophy. Aquinas' influence stretches far across the western world; much modern philosophy has been conceived as either a reaction against, or in accordance with, his original ideas. 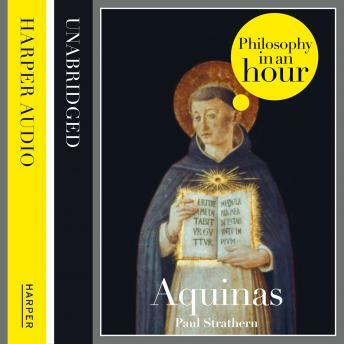 This audiobook showcases an account of Thomas Aquinas's life and philosophical ideas - entertainingly written and is above all easy listening. Also included are selections from Thomas Aquinas's work, suggested further reading, and chronologies that place Aquinas in the context of the broader scheme of philosophy.